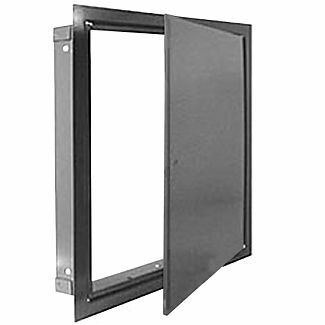 The DSC-214M is a distinctly superior door for new installations or for remodeling. The exposed flange adds rigidity to the unit and perfectly conceals the rough wall opening. Flexible anchor straps can be provided for installation within masonry opening. 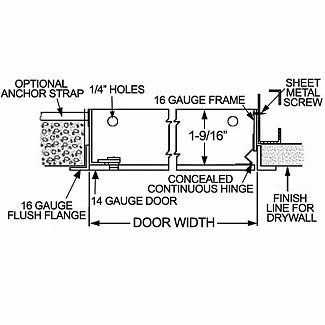 16 gauge steel frame and 14 gauge door steel with 3/4" wide trim, one-piece construction. Flush lock, screwdriver operated with stainless steel cam and stud or cylinder lock with dust shutter. Prime coat rust inhibitive electrostatic powder, gray enamel. Door Size: 24" x 24". Opening Size: 24-3/8" x 24-3/8". Note: This product is also known as KAR-MP2424S on other websites.